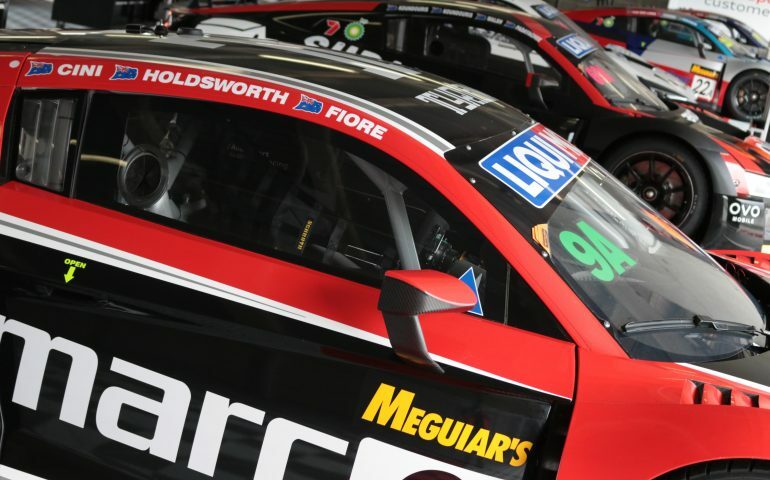 LEE HOLDSWORTH and Dean Fiore will return to the Liqui-Moly Bathurst 12 Hour in 2019 in a continuation of their long-term partnership with Marc Cini. The trio will join forces aboard Cini’s Hallmarc Property Group Audi R8 LMS for the third consecutive year and will likely be strong contenders for the BRM Chronographes Pro-Am class honors. The car will be run by Audi Sport Customer Racing Australia. | Grab your 2019 Liqui-Moly Bathurst 12 Hour tickets and camping online now and save! Cini, Holdsworth and Fiore failed to finish in 2018 however the trio finished ninth outright in the 2017 around-the-clock classic. Holdsworth, who departed Team 18 after this year’s Virgin Australia Championship campaign, is currently without announced plans for 2019 while Fiore finished 7th in the Dunlop Super2 Series driving a MW Motorsport Nissan Altima. Cini, meanwhile, finished 21st outright and 7th in the Pro Am class of the Porsche Carrera Cup Australia Championship where he is the series’ most experienced driver. The Melbourne businessman also has a lengthy record in the 12-hour with 2019 to mark his eighth start in the race, having missed just one race since it became a GT enduro in 2011. As well as finishing ninth with Holdsworth and Fiore in 2016, Cini was 10th in both 2014 and ’15 sharing his Audi with Mark Eddy and Christopher Mies. His best result came a year prior when he finished 5th outright in the 2013 edition driving with Eddy, Mies and Dean Grant. Holdsworth, who finished 6th in the 2013 Bathurst 12 Hour when driving for Erebus Motorsport, said he was pleased to link up with ‘a couple of decent blokes’. “To team up with Deano and Marc again makes for a good, fun weekend,” he said. “The Bathurst 12 Hour is growing as an event each year and it’s now really an internationally renowned, bucket list type of event. To be involved is a privilege. “It’s a nice way to start the year and get the ball rolling and get your head back into gear before the Supercars season starts. Changes to the Event sporting regulations for 2019 will see the Pro/Am and Am classes feature increased competition – with more emphasis now on the ‘Am’ component on each driver line-up completing more seat time during the race. “The Pro-Am class is very competitive,” Holdsworth said. “But I think with some of the rule changes it gives us a better shot. With the driver times in place it means you split the race evenly between your drivers which makes it a lot more fair for us – and a lot of other cars as well. Holdsworth said racing with Fiore and Cini had proved to be an especially good way to start the racing season each year. “Marc is a fantastic character so to spend the weekend laughing together with he and (wife) Kerri Cini makes it enjoyable.